HARMAN today launched the JBL Boombox Bluetooth speaker in India. The speaker is capable of delivering exceptional sound and hard hitting bass, Also comes with IPX7 rated for Waterproof. It comes with a 20,000mAh rechargeable Built-in rechargeable Li-ion battery. 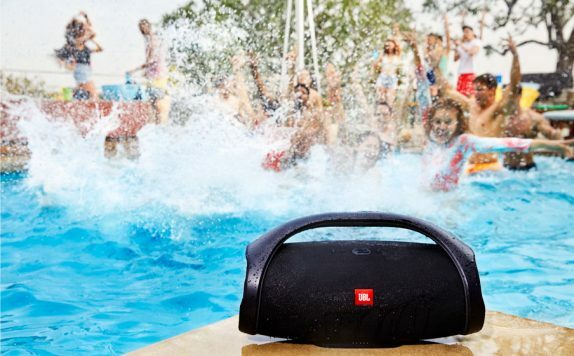 The JBL Boombox portable speaker enhances the overall sound quality and Bluetooth streaming experience. It weighs at just 5.25 kg and nearly 50 cm long. The speaker’s large frame is equipped with four transducers and two bass radiators, providing powerful sound and bass. The company is promising 24 hours of continuous playtime. Since it comes with dual charge out, you can continue listening to music simultaneously charging it. The Boombox can connect to more than 100 JBL Connect+ enabled speakers within Bluetooth range, taking the sound experience to the next level. It is also capable of wirelessly connecting with up to two smartphones or tablets to the speaker. There are dual USB ports for connectivity option.It comes with sound modes with deeper bass and richer sound in indoor mode and the outdoor mode for expansive sound with strong bass and more extended playtime. JBL Boombox is priced at Rs. 34,990 and will be available in black color through HARMAN’s e-commerce platform, various online and retail channels and at 350 key Samsung brand stores across in India.